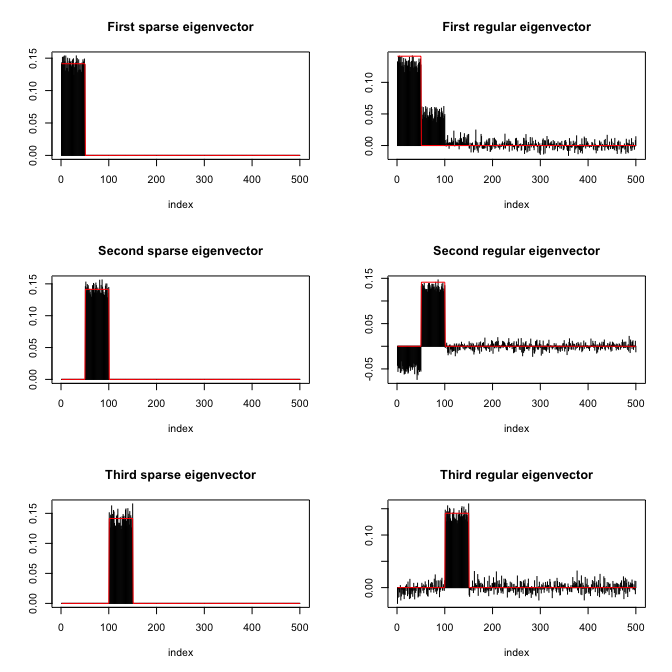 Computation of sparse eigenvectors of a matrix (aka sparse PCA) with running time 2-3 orders of magnitude lower than existing methods and better final performance in terms of recovery of sparsity pattern and estimation of numerical values. Can handle covariance matrices as well as data matrices with real or complex-valued entries. Different levels of sparsity can be specified for each individual ordered eigenvector and the method is robust in parameter selection. See vignette for a detailed documentation and comparison, with several illustrative examples. The package is based on the paper: K. Benidis, Y. Sun, P. Babu, and D. P. Palomar (2016). "Orthogonal Sparse PCA and Covariance Estimation via Procrustes Reformulation," IEEE Transactions on Signal Processing . This package provides functions to compute sparse eigenvectors (while keeping their orthogonality) or sparse PCA from either the covariance matrix or directly the data matrix. The function spEigenCov() requires more samples than the dimension (otherwise some regularization is required). Therefore, we generate data as previously with the only difference that we set the number of samples to be n=600.